Here in Quebec, our hydro-electricity is so readily available that we have the cheapest rates in North America. Electricity is abundant, the valleys are already flooded, ecosystems lost ages ago (seriously though: dams are a problem), and the resulting methane production is dwindling. So why would anyone care about how much clean electricity we use? After all, it is the best in Canada (ergo, North America) for GHG emissions. We seem to have done a few things right, no? Well, yes, but wait. As more people move to the cities [when they should really be moving (back) to the regions], efficiency increases the perception of abundance, and the draw on the power grid increases. The cities are not doing enough, yet, for themselves to keep the demand steady-or-less, or supply more of their own. Until businesses, municipalities, and utilities develop a local private/community power model, that electricity must come from somewhere. HydroQuébec doesn’t have many, or even any, incentive programs to help people switch to off-grid electricity generation, though, unbeknownst to many, it finally established a net metering option for self-generators to feed power back in to the grid. That will help a bit. “During cold periods, consume wisely.” So unplug unneeded devices, put the dishwasher and laundry on timed delay, and program your thermostats! Elsewhere, many utilities practice load-balancing: timing periods of demand by offering consumers preferred rates, after businesses close down for the evening and overnight (when one can run the dishwasher, laundry, bathe and shower, and charge electronics). HydroQuébec doesn’t do this, either. And yet meeting future peak demand is why they want to develop new sources. The kicker is, cheap electricity is practically designed for waste. Which is a problem, when we could be making more money if we were more conserving of it. HydroQuébec exports its power to Ontario, New York, New Hampshire, Maine, and Vermont, where non-hydro sources are still used: nuclear, coal, other. If we collectively cut down our electricity consumption, HydroQuébec would be forced to make export deals and improve long-distance transmission to other markets. This would mean that fewer mountain top habitats in Appalachia (which extends into Quebec, by the way) would be blasted into oblivion to get at the coal. Load-balancing our demand would send further into the future HydroQuébec’s construction projects, including harmful ones like biomass. By “biomass,” they say liquor from pulp and paper mills, but they also mean forest litter. They don’t mean garbage or sewage digestion, which would be far better used to feed into Gaz Metropolitain’s supply chain, which instead comes from Alberta. The planned life span of an electric plant is 50 years. There is only a 2% turnover rate of existing electric plants per year, but plants can be – and hopefully are – upgraded to the greenest technology available. Even hydroelectric plants could have a smaller impact on the environment. Because of the impacts of damming in western rivers, salmon are critically endangered and there is not enough political will to help them, and help the Southern Resident orcas that survive on them. It’s a sobering thought: what kind of world we have for the next 50 years if, for every upgrade, or new plant installed, they DON’T have the greenest, most low-impact technology possible? And a dam removed in the Olympic National Park in Washington state is now being renaturalized by humans and animals alike. So where do YOU fit in with this concern? With energy efficiency, by sealing off heat losses. That’s where, at least if your heat is electric. If it isn’t, try some tips in Saving Electricity in Winter, and consider (a much newer post) installing a Pellet Stove. 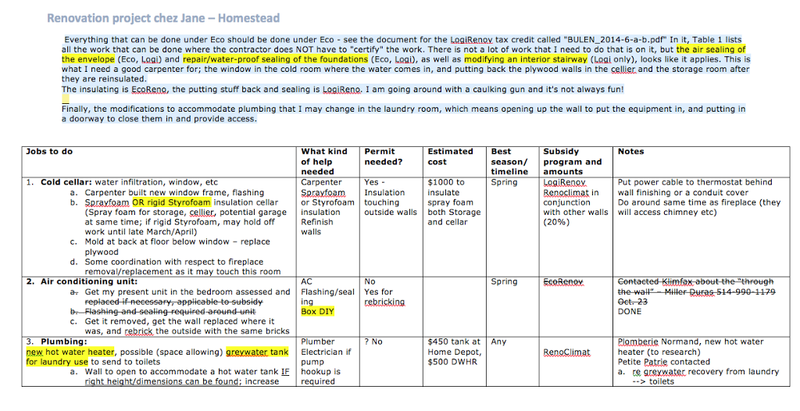 With the recent blizzard that swept through Montreal that left about two feet of snow, I had an ample draft of -10º air coming in through cracks (a direct effect of sloppy construction inspection-related to the side effect of cheap electricity in the 1980s). So I went on a hunt to seal them with weather-stripping and caulking – available at any hardware store. I started this process years ago, when I first bought the place. Brrr! I also wrapped my AC unit in window plastic on the inside and duct-taped it on the outside a few days ago. It is not the best unit for the job, so I will be getting rid of it in the next year or two. They had done a bad job insulating the front of the house where the second floor overhangs my front porch, and I have to keep that bedroom door closed, to keep its cold air from taking the heat from the rest of the house. I will upgrade this, too, with the coming green renovation. Here’s a little thing you can do, too: I went to the hardware store Thursday morning and picked up these little plug seals. I opened up all the electric outlets and some light switches, and applied the insulating covers. I then put the child-proof seals through the insulation, as shown. Electric outlets are a major source of drafts and loss of heat. I wish more apartment dwellers would make this small investment (probably $20 to kit out a large one-bedroom apartment) and cut their heating bill in turn. Today, the temperature difference between the cold bedroom and the rest of the house feels less extreme. It’s winter, and we’re not in California (where it still gets cold). Put on a sweater or a housecoat and slippers at home. Get good boots and a good coat and a good attitude for the outdoors. The lower you keep your thermostat at home (18º-20ºC – lower overnight, or while away), the easier winter seems. Remember: animals habituate to the cold, and so do we. Recessed lighting, so beloved by designers and normal humans alike, should not be put into a ceiling that goes into the attic or space below the roof. It might look nice, but the fact is, you’re creating a hole 5″ in diameter through which all the heat escapes. As heat rises, you’re pulling air in from below, which means you are paying to heat fresh air that must come in from the outside. My attic has 11 rows of batts, which I will double, to take my attic insulation from R-20 to R-40 or R-50. Not only that, but unless you had put in a fireproof box surrounding that lighting pot – not many people have done this (it only marginally reduces the escape of heat from your home) – you are putting yourself at risk of an electrical fire in your attic, because like the picture demonstrates, the insulation bats were layered on top. The dark staining that you see on the Fiberglass Pink is where the batt has acted like an air filter. It gets dirty. Fibreglass is slow to catch fire, but it can if things melt down due to heat or sparks fly out due to damage. 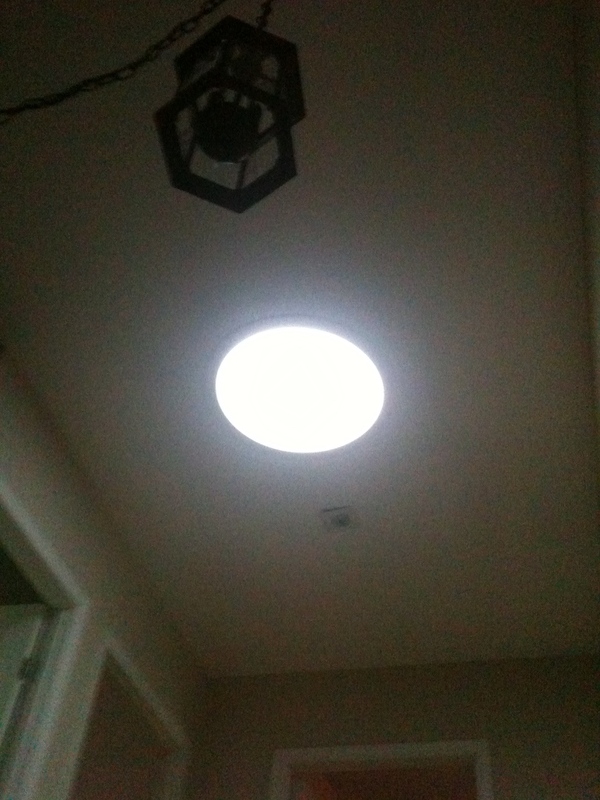 One of my priority projects was to remove the seven recessed lights in my attic ceiling, and cut down on those drafts. 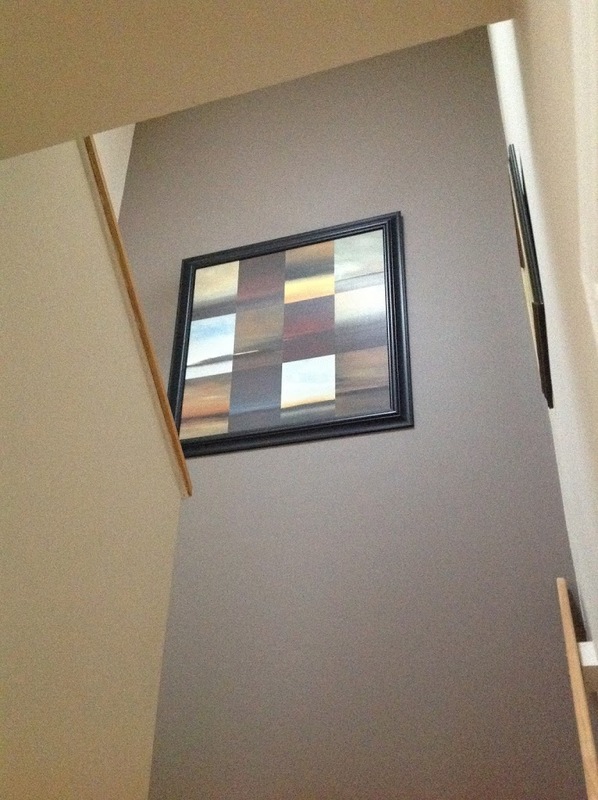 Three were in the foyer ceiling (pictured below), and four in the bathroom. 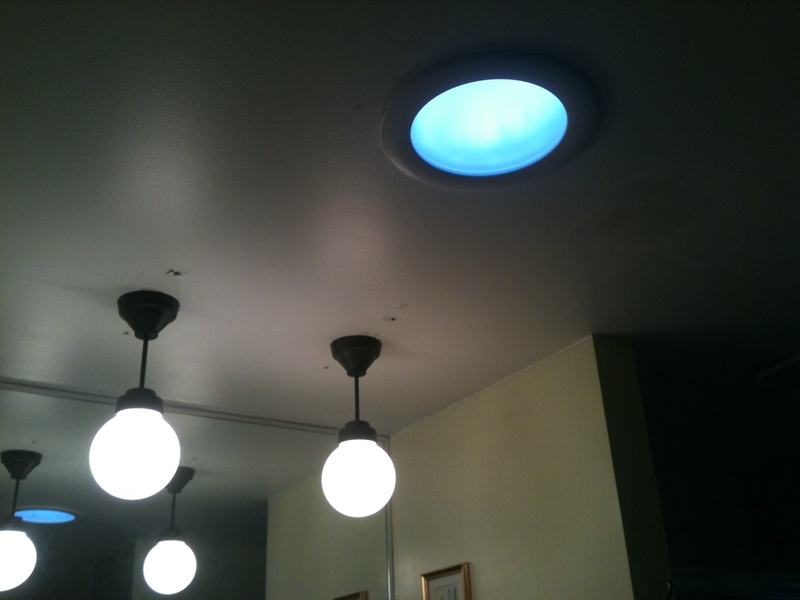 I moved these recessed lights down to my finished basement, which was dreadfully dim, with only one recessed light and a couple of sconces. 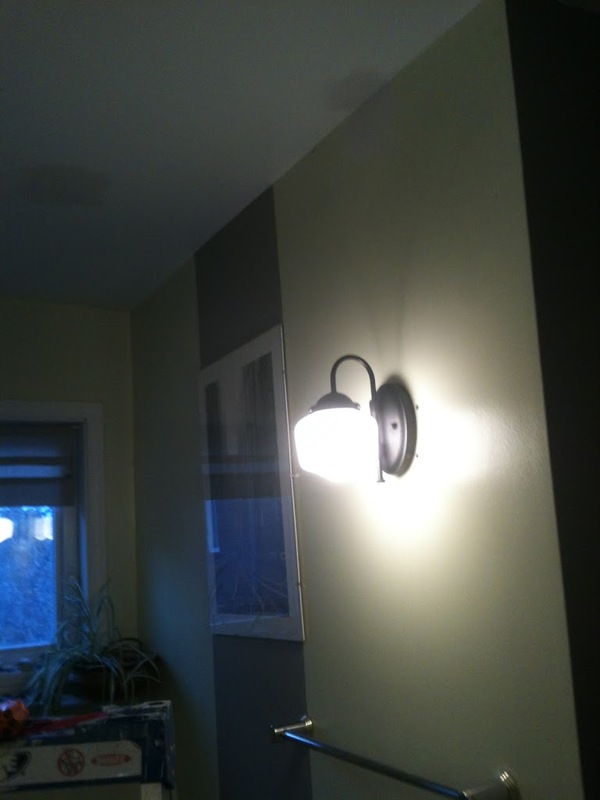 But first: I finally found some sconces I liked, at ReStore, the store for recycling home renovation materials and decor. A bad pic, but they are fancy! Here are some pics of the basement now that I moved five recessed lights down there (there are now six). How dim it was before the change! Although I had two table lamps and two desk lamps that kept things cozy and functional. The pendulum lamp above my couch is a kitschy red light (so I moved it to the bedroom). My basement is due for a declutter. The holes in the ceiling, patched (but not painted yet), and the new sconce, which is connected to the ventilation switch. 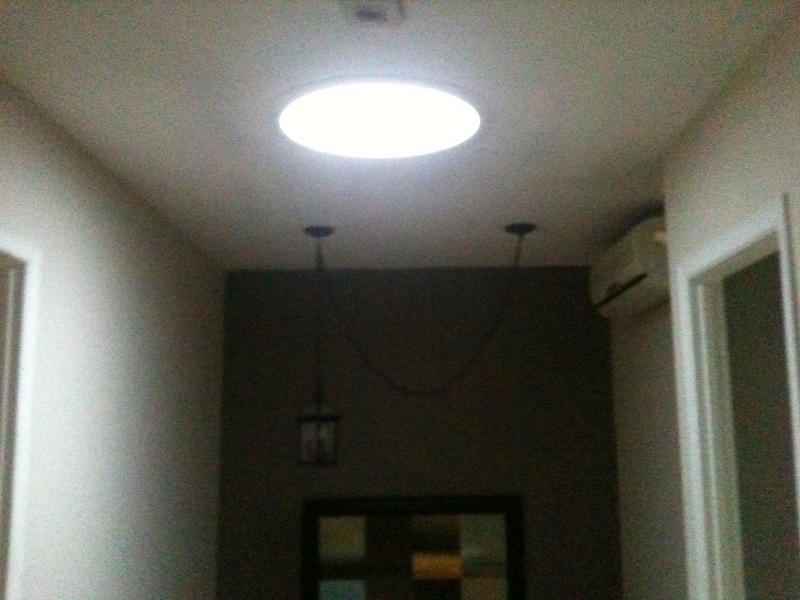 It more brightly illuminates the shower and the toilet. Meanwhile, upstairs, I patched over the holes in the ceiling. 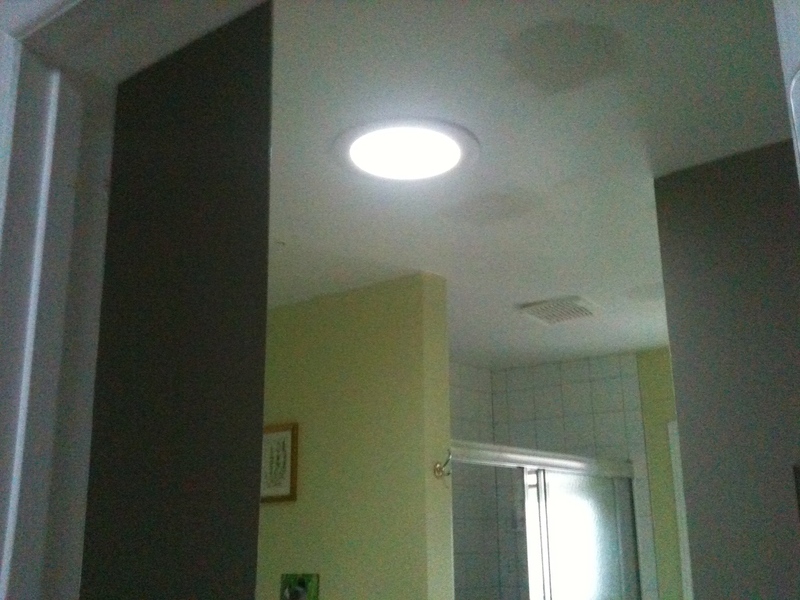 I also installed a new sconce in the bathroom, and temporarily installed some old track lighting with the fixtures I want to keep, while I wait to get started with the solar tunnel project. That will be happening in December.